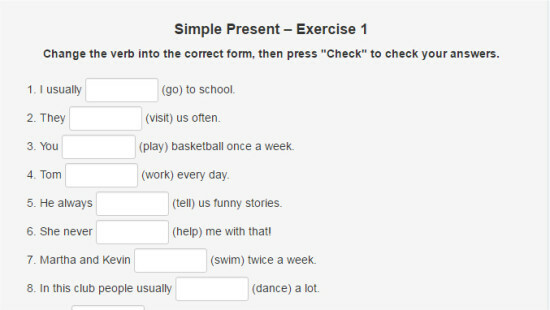 If you’re looking for simple present tense exercises to test yourself, you’ve come to the right place. Below you’ll find three different simple present exercises to try so you can determine your understanding of this tense. The quizzes are easy to do. Simply fill in the blank spot with what you believe to be the correct simple present tense for each sentence (the verb to be used is in parentheses). When you’re finished, you’ll automatically be given your score, as well as shown which, if any, exercise questions you missed. Good luck with the exercises! You may not be writing at your desk right at the moment, but it’s something you do, so you use the present tense to describe an existing habit – or a habit you currently don’t have, as we saw in the example. Of course, that could be a question too: “Do you write at your desk?” or “Does he write at his desk?” The verb is present tense: “write” not “wrote”. In every case, you see the verb, in these examples, “write” or “leave” happening in the present tense. You wouldn’t say “Does the bus left at 8:00AM?” would you? And if you were to say “I wrote at my desk,” there’d be no indication of it being something you still do on a regular basis. In fact, it would look like something you don’t do anymore, or don’t plan to do again until further notice. As you can see, this isn’t hard. Our ‘dogs’ example is a generalization, let’s look at a fact: “Paris is the capital of France.” There’s no arguing with that, is there? Your use of the simple present tense tells your listener that you’re talking about an existing situation that you expect won’t change overnight. To stretch our example a little further, you could be denying or asking about a fact or a generalization. “Paris is not the capital of Spain,” or “Is Paris the capital of France?” You can even use this tense to tell lies: “Paris is the capital of Spain.” Yes, it’s silly, but it’s still grammatically correct. 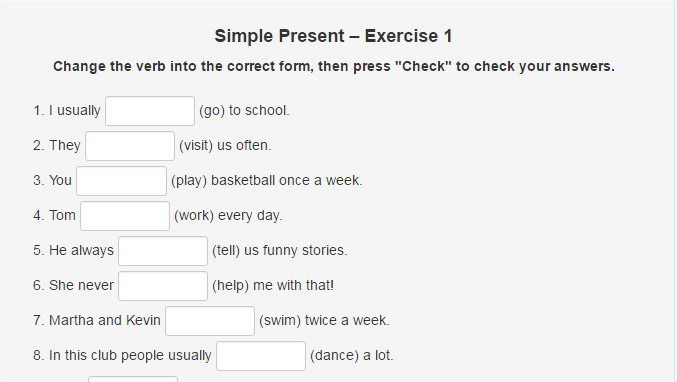 This is the simplest use of the simple present tense. It’s happening, or it’s supposed to be, but isn’t, or you want to know if it is happening. “I am available now.” “I am not available now.” “Are you available now?” Easy peasy, right? Habits will often be expressed with an adverb such as “sometimes”, “often”, “always” or “never”. 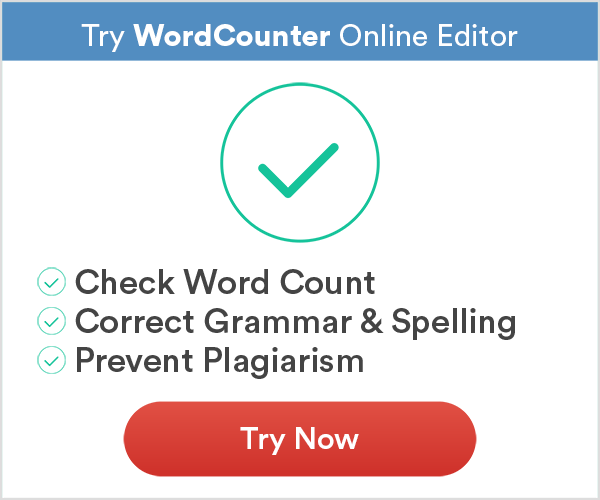 You may not use the adverb, but it could be placed if you desired. For example, “I write at my desk.” You could put “always” or “never” into the example, and it would be correct (I always write at my desk” or “I never write at my desk”. The same goes for “only”, “ever”, “still” “often” and “just”. If your spouse were to ask: “Do you often stop at the pub on the way back from the gym?” that’s also simple present tense. You might reply “No, I only go to the gym,” or “No, I never stop at the pub.” Of course, the truthful response may be “Yes, I often stop at the pub,” but whatever the reply, you’re using the simple present tense – as did your spouse. Depending on whether you’re using active or passive voice, your simple present tense verb may fall into the past tense. Crazy? Not really. Here’s an example: “The dog catches the ball.” That’s clearly active voice. The first noun (dog) acts out the verb (catches). Those are the basic rules when it comes to the simple present tense in English. If you weren’t able to get 100% on the exercises above, you can now try again with your new knowledge of how this tense works! Thank you for this. I had my students who really needed a chance to practice the simple present tense and this post gave them a great opportunity to do so. I would love to see more exercise sheets like these for other English grammar that students need to learn. I don’t understand how someone could not understand the simple present tense. It’s one of the easiest things to understand about English. The only people who can’t understand this stuff are people who don’t care about English and never study. I would be embarrassed not to know this. When you get on all the Social Media sites these days it is pretty obvious that not everyone is able to construct sentences in a proper way anymore. It’s really encouraging to see a post like this which actually can help to improve grammar. There are a lot of people learning English as a second or third language. Would you say the same thing about Spanish if you were trying to learn it? You might want to try to think outside your own lie to others who may not be in the same position as you. Just because you happen to be a native English speaker doesn’t mean that everybody is. It is so strange to see how language is changing. So many people aren’t able to use the right tense when speaking. This is a very helpful exercise for anyone who is struggling, needs a refresher, or is just learning present tense for the first time. It is sad to see how grammar is used these days. So many people do not know how to use words properly. This surely helps to see how it should be used.